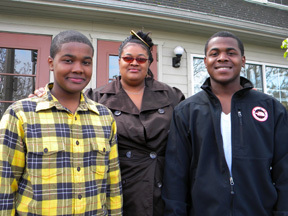 LaTangie Myles and her two sons Jeremy, 20, and Kwaku, 12, have lived out of boxes for the past two years. As an education assistant at a local elementary school, LaTangie doesn’t earn enough to afford simple, decent housing for her family. The last apartment the three-person family shared only had one bedroom. LaTangie used all of her earnings from her job to cover the cost of renting the apartment and supplemented their cost of living with credit cards. After her hours got cut by her employer, LaTangie and her sons were forced to give up the apartment and stay where they could with friends and relatives. The stress of their living situation eventually caught up the family. LaTangie often feels hopeless and guilty as she continually struggles to put a roof over her son’s heads. Since their acceptance in the Habitat program, the family’s outlook has started to change for the better. “Kwaku is so happy about finally have a place of his own and we won’t have to move, and Jeremy is looking at going to college at PCC,” she said. LaTangie participates every Saturday on the Habitat construction site, working towards her 500 hours of sweat equity. She looks forward to her family being able to establish roots in a stable community and having space for both of her boys to continue to grow.